Bet9ja is giving away three Sony PS4’s ! Multiple entries from the same accounts will be disqualified and comments underneath the Facebook post are not valid entries. 1. You must be 18 years or over to enter this competition. 2. To enter the entrant must enter their details by inputting their details into a form which can be found by clicking on the link in the Facebook post. 3. Customers who comment in the Facebook comments section will not be considered as valid entrants. 4. All valid entries will be entered into the competition and 3 winners will be selected using randomisation software. 5. The winner will receive a Sony Playstation 4. Bet9ja reserves the right to make winners collect the prize at an address of Bet9ja’s choosing such as one of our shops or main offices. 6. 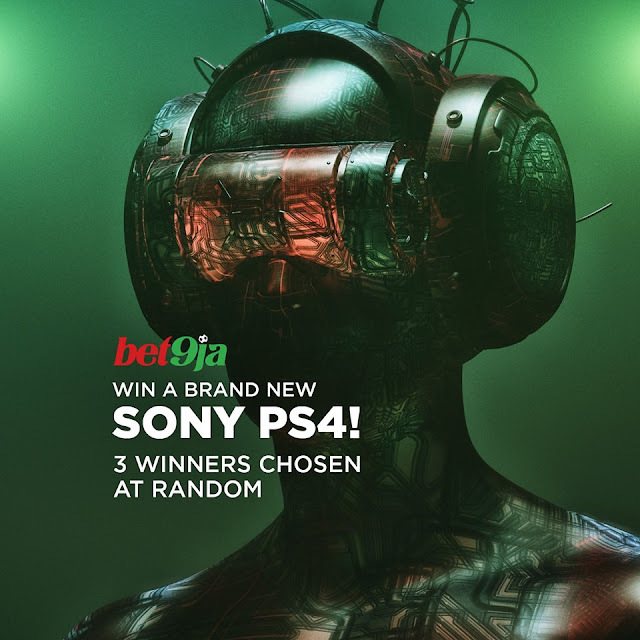 Bet9ja may make provisions for the Sony Playstation 4 to be delivered to home addresses of winners if collection at our office is not possible. 7. To win this prize you must have a registered and valid Bet9ja account. 8.Only one Bet9ja account is allowed per person. Multiple accounts will be closed at the discretion of Bet9ja and can result in disqualification from the competition. 9. Only one entry is allowed per person. Multiple entries will result in disqualification. 11. Bet9ja will contact the 3 winners privately through the details associated with their Bet9ja account. 12. Bet9ja will not be held liable for any failures in the delivery process which means that the prizes are delayed in reaching the winners if a delivery option is chosen. 13. While Bet9ja can offer an estimate as to when the winners will get their prize we cannot offer any guarantees. 14. Bet9ja reserves the right to announce the names of the winners on our Facebook page. 15. If the winner/winners cannot be contacted, we reserve the right to withdraw the prize from the winner and pick replacement winner/winners. 17. This Competition is in no way sponsored, endorsed or administered by, or associated with, Facebook. You are providing your information to Bet9ja and not to Facebook. 18. The closing date for entry of this competition is Sunday 17th December at 5pm Nigerian time. 19 At any time through the course of this competition can Bet9ja change cancel or revoke the terms of this competition and Bet9ja’s decision is final. 20. General Bet9ja’s Terms and Conditions apply to this promotion. The closing date for entry of this competition is Sunday 17th December at 5pm Nigerian time.